Halloween is over. The jack-o'-lanterns have been tossed into the compost pile. But let's not turn our backs on the glorious pumpkin. Yes, there will be pumpkin pie at Thanksgiving (if you're in the U.S.) and possibly after Christmas dinner. In the meantime, get the antioxidant health benefits of pumpkin in a delicious warm loaf, perfect for a Sunday brunch or a snack to enjoy on a mid-morning work break. This makes the third pumpkin loaf recipe I have posted on the blog. The first was this Pumpkin Banana Date Loaf. The next was this Gluten-Free Vegan Pumpkin Loaf. 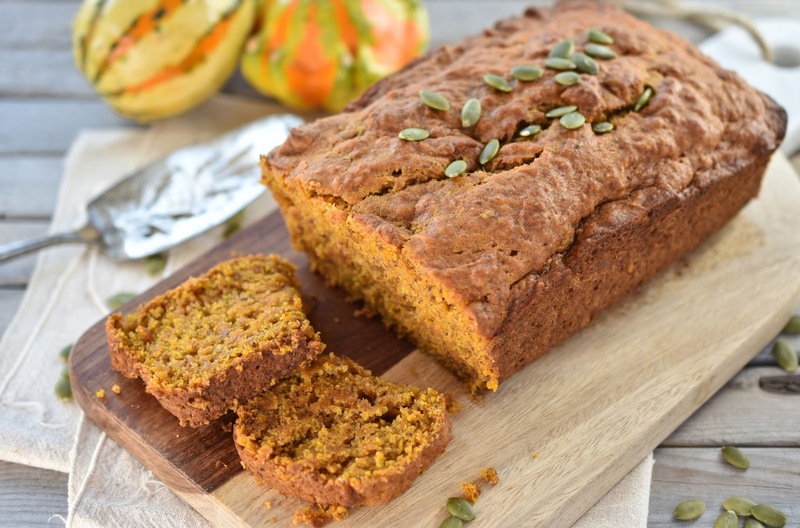 Today's Simple Vegan Pumpkin Loaf is a quick and yet still very tasty alternative for those who don't require gluten-free foods. It's perfect for those moments when you want to make something that doesn't require a lot of effort or ingredients. I use light spelt flour, but you can use regular all-purpose flour too. I use canned pumpkin puree to make this recipe super effortless. I usually have a can of pumpkin puree open in the fridge because I give the dogs a spoonful of it each day. Ace needs more fibre (we won't get into why at the moment, because it's kind of gross) and Jolene expects to have anything he's eating too. For us humans, pumpkins offer vitamin A, vitamin C, antioxidants and fibre. They also provide potassium and zinc. You just know from their beautiful orange hue that they are going to be good for you! A blend of cinnamon, nutmeg and allspice gives this moist loaf a gentle hint of spices. I have cut down the amount of sugar from my previous loaves and found that it is plenty sweet. I use ground flax in place of egg, so you don't need to have powdered egg replacer handy in your cupboard. Essentially anybody with a minimal range of spices and baking products in their cupboard can make this loaf. So make one for your vegan and egg- or dairy-allergic friends to enjoy over a cup of tea! 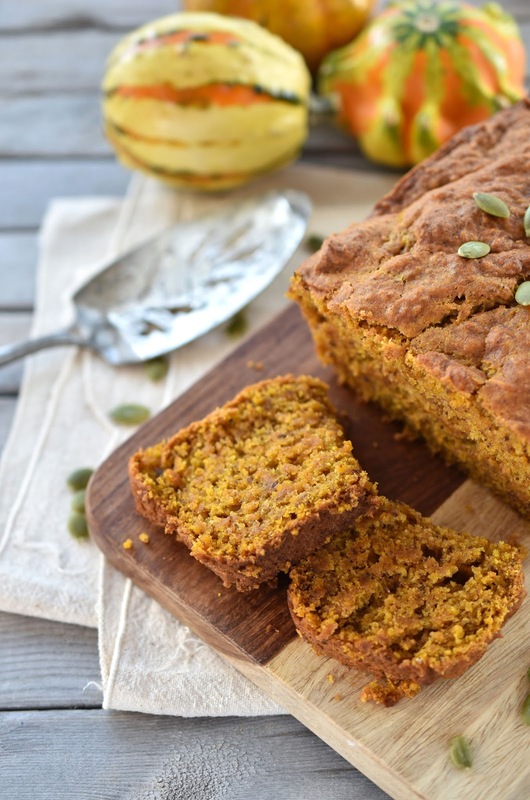 It's always a good idea to have a simple pumpkin loaf in your baking repertoire. Are you still enjoying pumpkin-based desserts and drinks in November? Lightly oil a loaf pan. In a large bowl, stir together the flour, baking powder, baking soda, cinnamon, nutmeg, allspice and salt. In in medium bowl, whisk together the ground flax, pumpkin, oil and milk. Add sugar and vanilla and mix together. Add the wet mixture to the flour mixture and stir until combined. Pour the batter into the prepared loaf pan and bake 45 to 50 minutes or until a knife inserted in the center comes out clean. Cool completely and turn out onto a cutting board to slice. This is exactly the recipe I needed! Will definitely try it. fairly simple ingredient list! Looks so tasty! Yes, I like to keep things easy when possible. :) Thanks so much! I totally agree, I still want to see pumpkin recipes! These bread looks so amazing, perfect for Thanksgiving! Love that's it's gluten free so everyone can enjoy it. :) PS your pictures are beautiful! This is a great loaf! So pretty. Perfect fall fare and would be great to take along to Thanksgiving. "I usually have a can of pumpkin puree open in the fridge because I give the dogs a spoonful of it each day." Ah - wish I could do the same. My poor pup seems to have a bad sensitivity to pumpkin (also gross - pups can be gross, good thing they are so cute!). Gorgeous pictures. 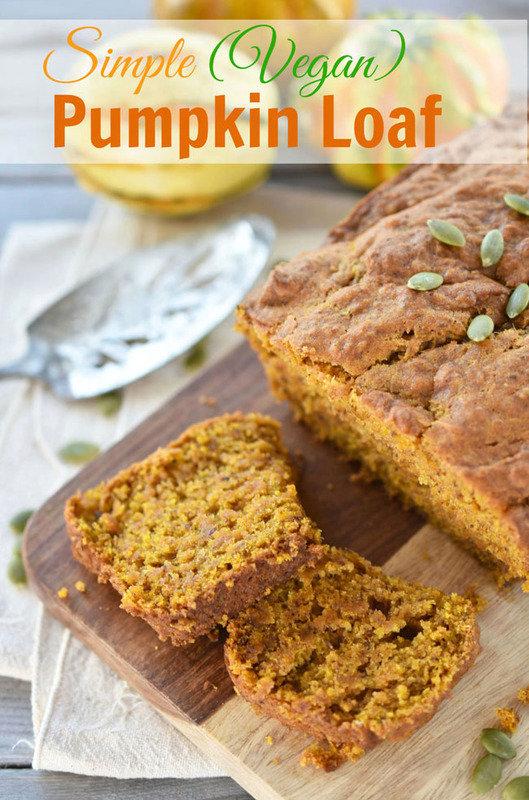 Absolutely love simple vegan pumpkin loaf recipe!I prefer pumpkin - it may reduce cancer risk, protect the skin, boost your mood and other! I'm also gonna pin this post on my Pinterest board my followers will love it. Thanks for sharing, Joann! Isn't this recipe also gluten-free? Comparing it to your Gluten-Free Pumpkin Loaf, it seems to be very similar. Hi Joy, The recipes are similar however this one uses spelt flour, which is not gluten-free. I have never baked with or used spelt flour. Going to pick up some and give this loaf a try. Hopefully our Bulk Barn carries it. Perfect for those cooler days. Thanks! 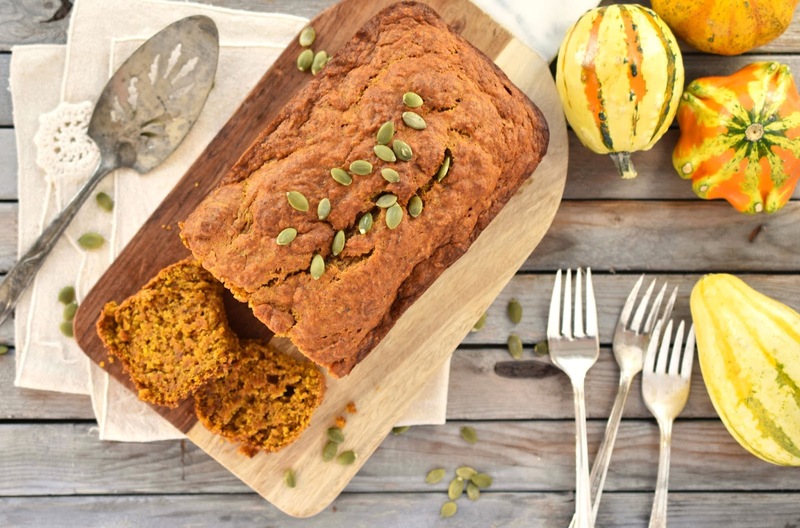 Definitely, your vegan pumpkin loaf is awesomeness! This is a great recipe Joann, as you know I made it a short while ago and it was lovely, in fact, have made it again since. Thanks for sharing!